Sanyo this week introduced a new model in its line of LCD projectors, one that brings, for the first time, high-speed 802.11n wireless connectivity to a portable system. 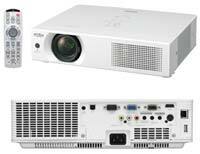 The PLC-WXU700 is a 16:10 WXGA (1,280 x 800) LCD projector offering a brightness of 3,800 lumens and a contrast ratio of 500:1. Its 802.11n wireless connectivity allows for both LAN-based management and video streaming of MPEG-1, MPEG-2, MPEG-4, and WMV video files. The projector incorporates Windows Embedded CE 6.0 software, allowing it to be used as a network projector for computers running Vista. It also supports wireless connections with other systems, including Macs. RJ-45 100Base-TX/10Base-T wired connectivity (in addition to 802.11 b/g/n wireless). Video inputs include HDMI, dual mini D-sub 15 ports (analog R GB or component), S-video, and composite video. It also includes monitor out via mini D-sub 15. Other ports include RS-232, USB-A, and USB-B. The PLC-WXU700 weighs in at 7.9 pounds and measures 13.5" x 3.1" x 10.14". It's expected to be available in June for $2,995.